Park West Gallery artist Dominic Pangborn’s three-dimensional artwork “Michigan in Motion” is heading to the next round of voting for the annual ArtPrize competition in Grand Rapids, Michigan. 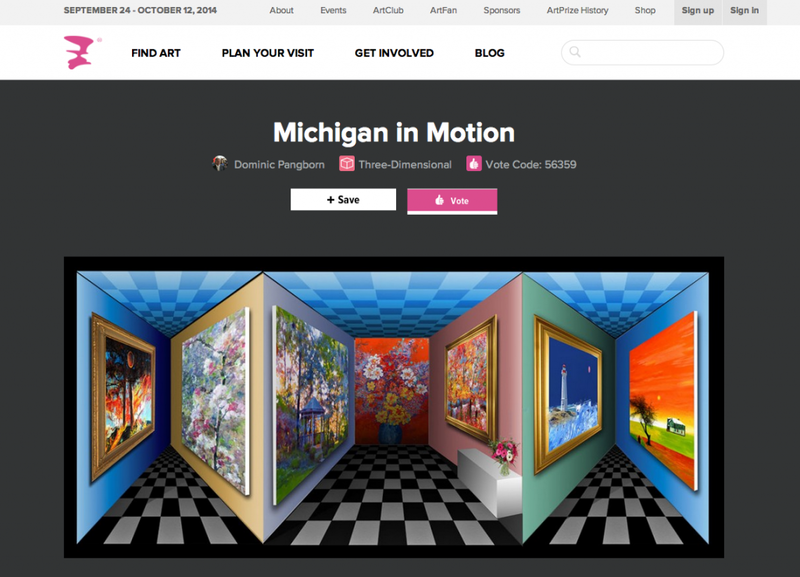 After the first round of public voting, Dominic Pangborn’s Art in Motion (AIM) piece – created specifically for the competition and featuring the sights of the mitten state – was a top pick. “Over the course of 11 days, 37,283 individuals cast 352,732 votes, selecting five entries from within each of four entry categories to move onto the second round. These 20 works have captured the public’s eye and will move to the second round of voting, where they will vie for the chance to take home $260,000 in prizes,” the contest website reports. 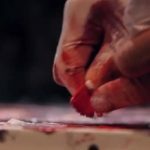 The Detroit artist’s AIM pieces are highly sought by Park West Gallery collectors. 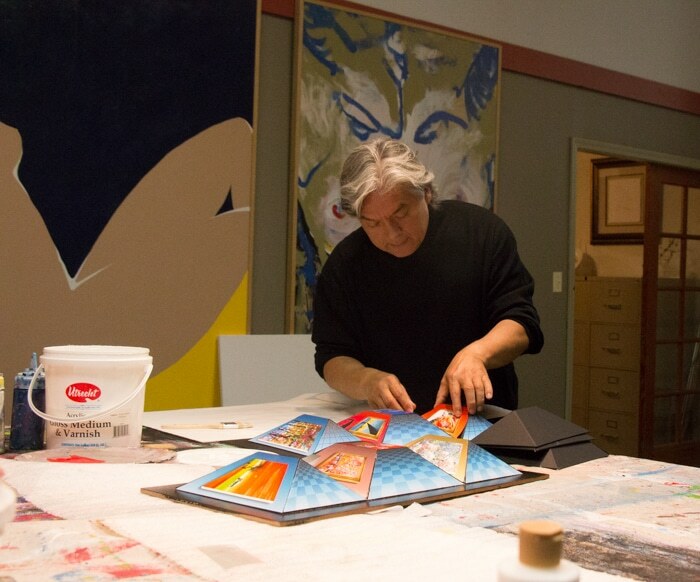 Dominic Pangborn works on an art-in-motion (AIM) piece of art at his studio in Detroit. His AIM works are a favorite among Park West Gallery collectors. 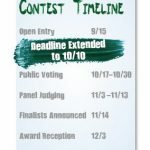 There’s a total of $560,000 in prize money at stake in both the public and juried voting. You have to be within the boundaries of the competition to vote. As Dominic’s three-month-long exhibit at Ella Sharp Museum in Jackson, Michigan, comes to a close Oct. 11, he’s enjoying the fun and excitement of ArtPrize as well as some recent media coverage by NBCnews.com and a soon-to-be broadcast feature on the Oct. 28 episode of Detroit Public Television’s Detroit Performs program. WE LOVE OURS. HUGS AND BEST OF LUCK. I have been collecting art from parkwest galleries for many years and I own one of his AIM pieces (POPPIES). I pass it every morning on my way into the kitchen and always smile when I look at it. its bright its cheery its exciting!!! I usually walk back and forth just to see the motion because it fascinates me. so glad I have it and will definitely buy another at the next parkwest gallery event that I attend in New York. Keep sharing your beautiful work with the world Dominic. thank you!!! Dominic was a delightful dinner and breakfast companion at the VIP event at the Nemacolin Resort. We purchased “Michigan in Motion” there and it was delivered yesterday and after being hung, our grandson could not stand still when he came in and saw it.